Codarra Advanced Systems has developed software to measure electrical loads on transportation platforms. Codarra developed the AVATAR as a private-venture R&D project to extend our in-house surveillance and image capture capability. 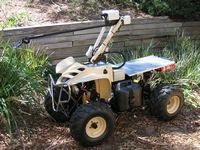 Codarra Advanced Systems is developing the SILVERBACK Unmanned Ground Vehicle to provide remote control reconnaissance. 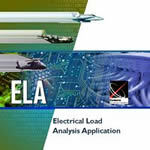 Build a database that lets you maintain a history of electrical load designs. 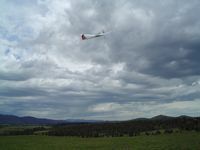 The AVATAR Unmanned Aerial Vehicle (UAV) was designed to provide short range 'over-the-hill' or 'around-the-corner' reconnaissance. Images were to be transmitted to ground forces in real-time to aid tactical planning and decision-making. The standard payload consisted of a hi-resolution digital camera that provided a real-time video downlink. Other sensors could be added to the aircraft to meet specific mission requirements. AVATAR was able to be broken down into small transportable sections that were carried in back-packs or 'Pelican'™ cases. SILVERBACK possesses video surveillance and audio communications that combines with its manipulator arm to distinguish it from other passive surveillance platforms. SILVERBACK can enhance the survivability of personnel by improving their situational awareness, and reducing their exposure to unnecessary risks from land-based threats. The SILVERBACK development path has the flexibility to include user-defined technologies. The current plan includes laser-range finder, deployable sensor devices, motion detectors and high-assurance weapon-control systems.